Opting to return to school to earn a Master of Business Administration degree is a smart move to expand your career opportunities. An MBA program provides you with crucial academic and practical training in an array of business areas—including marketing, accounting and human resources. In fact, MBA programs are essentially designed to prepare students for upper management and executive roles within business. Returning to school to study for an MBA is now easier than ever before. While you may already have a job or career of your own, it is possible to work and study simultaneously, thanks to the flexibility that an online degree program offers. At Villanova University, for example, the online MBA program allows you to study according to a schedule that suits you best, permitting you to balance work, family and social life commitments with rigorous study. You will also receive instruction from the same world-class faculty as onground students and will be invited to important on-campus events. The first step toward earning your MBA and joining the Villanova community is to take the GMAT exam. As with most reputable institutions of higher education, if you decide to apply to the online MBA program at Villanova University you will be required to take either the Graduate Management Admission Test or the Graduate Record Examination as part of the application process. The GMAT test in particular is designed for students looking to enroll in a business school. According to U.S. News & World Report, the GMAT will test your aptitude in several key areas: mathematics, writing and verbal communication. The official website for the GMAT explains that there are four sections in total—integrated reasoning, quantitative and verbal tests, and the analytical writing assessment. For the integrated reasoning segment and the analytical writing task you will be given 30 minutes to finish every question, and for the other two sections you will have 75 minutes. In total, the GMAT exam takes three hours and 30 minutes to complete. While any student is welcome to take the GMAT, it helps to have a solid academic background in subjects that pertain to business practice—for example, statistics, mathematics and economics. As U.S. News & World Report noted, a basic working knowledge in these disciplines can help you immeasurably, as statistics and logic-based questions are major components of the exam. If you are still studying for your undergraduate degree and your background so far has primarily focused on the humanities, it could be a wise idea to enroll in an introductory class for mathematics and statistics. Similarly to the SATs, preparation for the GMAT requires more than just learning facts and concepts. While this is an important first step, effective GMAT preparation involves the application of knowledge to various problems. Learning how to solve a problem or math equation may not be enough—you should also learn the overarching strategy and be able to apply the knowledge to a range of problems. As Bloomberg pointed out, the only way to ensure that you are comfortable with an array of questions is practice. Take as many tests online as you can. As outlined above, the key to GMAT success is continual practice. As The Economist argued, however, it is common for students to score higher on practice tests than on the real exam. This is because many individuals will feel less stressed and pressured when they study somewhere like their living room or a coffee shop. Consequently, an effective preparation strategy involves creating exam conditions at home. Turn off electronics, find a quiet room with no distractions and set a timer. Recreating the pressures of the exam environment beforehand will likely help you feel more adjusted and comfortable on the big day. Practicing in exam conditions will likely also give you a more accurate indication of how you will perform on test day. Timing is vitally important during the GMAT. Ensure that you practice good timekeeping prior to test day. Keep a stopwatch next to you as you practice and try to complete all the questions in the allotted time period. One strategy for effective time management is recognizing when to move on, the official GMAT website states. Do not spend an excessive amount of time on any one question—if you are unsure, select an answer and then move on. You can always return to it later if you have extra time at the end. 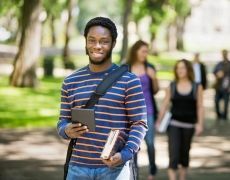 The GMAT exam is computer based, and the questions will change in terms of difficulty, contingent on how well you answer, U.S. News & World Report explained. In other words, if you answer several questions in a row correctly, the computer will generate further questions of increasing difficulty. Conversely, if you perform poorly early on, the difficulty level will decrease. Consequently, it is particularly important to perform well on the opening questions, as it will raise your overall score and generate new questions that will allow you to attain a greater number of points. It is important to keep in mind that your GMAT scores are just one area that admissions officers consider when reviewing your application. To apply to the online MBA program at Villanova University, you will be also be required to submit information such as academic transcripts, a resume and letters of recommendation. For further information, review the Villanova online MBA admissions page.